Maine might not have the deep Irish roots that Boston has, but we sure do know how to celebrate this holiday in style. 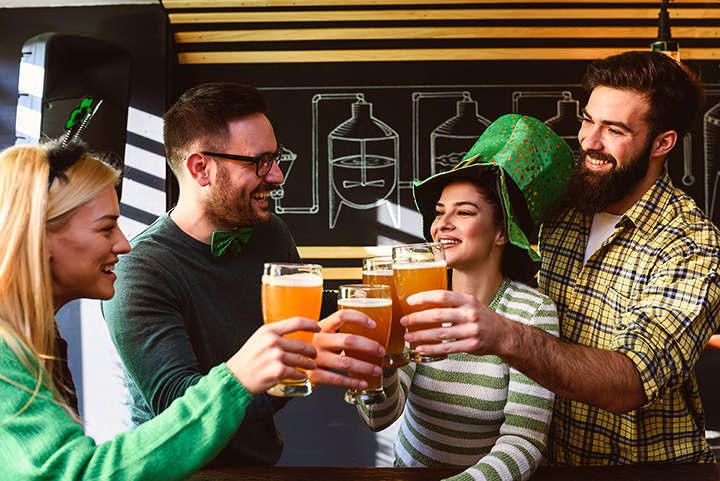 From Irish music and pints of Guinness at one of the many Irish pubs to parades to an ocean dip, put on your green and celebrate St. Patrick’s Day in Maine this year. Celebrate St. Patrick's Day by jumping in the cold Atlantic Ocean at 5:30 a.m. to support the Portland Firefighter's Children's Burn Foundation. After waking up to cold water, head to Ri Ra Pub for a free breakfast and a charity auction and raffle. Every year, this popular event brings a together a crowd of people. Hosted by the Irish American's Club at the Maine Irish Heritage Center, this event boasts quite the celebation, including live music, dance performances, and a catered spread of delicious food. Tickets sell out fast, so grab yours now! A cash bar is on deck for those who want to raise a pint of Guinness to this celebrated day. Brian Boru is Portland's quintessential Irish neighborhood pub, with a popular St. Patrick's Day celebration and all! Start your festive day with "tea, bacon sandwiches, pints of stout (not necessarily in that order". Finish the night off with a pint and some live music. Celebrate St. Patrick's Day in Maine's largest city north of Portland at Geaghan's Pub. Enjoy a locally brewed craft beer or a pint of Guinness. Wear your green and enjoy the good company and food provided by Geaghan's. Owned and managed by Irish native, John Bohill, this charming Irish pub in the lake regions is a great place to enjoy some Irish whiskey, a pint of Smithwicks, and a slice of Guinness chocolate orange cake. You won't want to miss this authentic Irish experience! With pubs in Bath and Brunswick, Brynes Irish Pub is a popular bar amongst the locals. Both pubs were opened on St. Patrick’s Day so the owners know how to throw a good party. Enjoy delicious traditional Irish dishes like bangers and mash and shepherd’s pie. Usually held on St. Patrick's Day weekend, the Portland St. Patrick's Day Parade celebrates Irish heritage along Commercial Street from the Fish Pier to the Ferry Terminal. There is often traditional Irish music and Irish dancing from local musicians and dancers. Located in the heart of Wells, Feile Irish Pub and Restaurant is owned and operated by Limerick, Ireland natives Joe and Tracy Ryan. The menu includes traditional Irish staples and traditional pub foods. They also have the largest selection of Irish whiskey in the state of Maine. Looking for authentic Irish items for your St. Patrick's Day celebration? Head to Celtic on Maine in Ogunquit jewelry, Irish sweaters, Irish flannel, and, of course, Guinness merchandise. This Irish pub and Mexican Cantina is the perfect place to celebrate St. Patrick’s Day. Wear your green, dance to some Irish music, and enjoy some tacos. With the only Irish pub in all of northern Maine, if you want to celebrate St. Patrick’s Day in Aroostook County then you need to head to the Irish Setter Pub in Presque Isle. The pub offers a solid selection of beer and food. With a permanent coundown to St. Patrick's Day on their wall, this authenic Irish pub in Portland is the place to celebrate. There will be traditional Irish fare, giveaways, a sea of green clad people, and much more at this lively Portland celebration.